Over the course of the first full year in rock, September 1947 through the early fall of 1948, it was entirely possible that the artist with the best and most consistent output during that time had exactly zero national hits to show for it. In the eight months since then however Amos Milburn has more than made up for it, notching five hits on his last three releases (two of the B-sides also went Top Ten). Of the three records he put out during this time two hit #1 and the other – the obvious slacker amongst them – only made it to #2 on the charts. I think it was safe to say that his time had finally come. Sometimes in the annals of rock ‘n’ roll the artists you legitimately feel have a right to expect to be superstars based on your subjective assessment of their work never reach that plateau, either through bad luck, cursed fate or the whims of a wider marketplace that doesn’t always share the same interests as you. But when the artist in question finally breaks through after what seems like a protracted struggle to be heard and appreciated by the masses it’s hard not to feel like it’s some sort of vindication for you the listener every bit as much as their ascendancy acts as confirmation for the artist’s own talent. Their success in a way becomes your success for singling them out as a future star long before anyone else took notice. Midway through 1949 though there’s nobody calling themselves a rock fan who would vociferously contest the statement that Amos Milburn is not only rock’s biggest current star, but that he is arguably its greatest talent. A lot of factors have gone into his rising status, obviously starting with his own talents as a singer, songwriter and pianist making him a rare triple threat who is able to take more hands on control over his output than many of his competitors who are reliant on outside material to keep them relevant while hoping to be paired with those who share a similar musical vision to put across the songs in a way that is up to date and appealing. But Milburn also lucked into a few things that certainly aided his cause, namely landing at Aladdin Records which had a pretty firm grasp on the market and weren’t longing to make inroads to the white pop field and in the process risking the ire of their core fan base by pushing their artists away from those tastes in search of something bigger and presumably classier. On top of that the label’s finances were reasonably strong and their distribution network had national reach allowing his records to be heard coast to coast at a time when many artists could only pull regional interest. 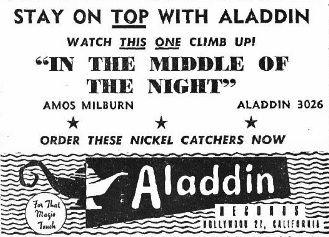 But most importantly for Milburn’s continued musical flowering Aladdin employed Maxwell Davis as their house arranger and producer and he was merely the absolute best at both of those tasks of anybody in rock ‘n’ roll during this era. There’s not enough glowing testimony that can be given for Davis’s role in rock’s meteoric rise in the late 1940’s and early 1950’s. A gifted songwriter and one of the top saxophonists on the scene who lent his horn to countless West Coast sessions, not just for Aladdin but most of the Los Angeles based labels at the time, Davis had found in Milburn an artist with whom he meshed with uncanny precision. No matter what type of material Amos brought in – fast, slow, joyous or despondent, crude or sly in nature – Davis found a way to embellish it even more in the arrangement. Every detail was carefully thought out, each instrument deftly utilized and all of these components were designed to bring out the subtleties that Milburn himself was so skilled at revealing. Once again the two of them each get to display their wares with aplomb on the subtly shifting internal musing that is In The Middle Of The Night, a record which landed Milburn his fourth consecutive Top 3 hit on the national Billboard charts, a run of success unmatched by any rock star to date, and one which – spoiler alert – was far from ending. 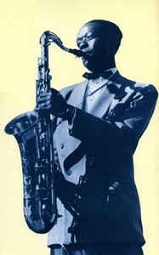 If there were any sideline critics in 1949 who had remained stubbornly unconvinced of his prowess, perhaps harping on the one misstep by Aladdin which placed Jitterbug Parade (an unimaginative regurgitation of the previous fall’s monster hit Chicken Shack Boogie that first launched Milburn into the stratosphere) as the designated A-side of his last effort only to see the astute audience reject it outright before flipping the record over and embracing the far more original Hold Me Baby (which hit #2), there was nothing here to justify their continued reluctance to embrace his stature as the top dog. For even those resolute doubters had to concede with this outing that Milburn’s versatility was going to be hard to beat going forward because In The Middle Of The Night adds yet another facet to his persona. Though we’ve seen – or rather heard – Milburn wallow in late night regret before this, giving remarkable depth of feeling to such pieces as I Still Love You from way back in the fall of 1947, this offers us that same character imbued with a little more self-awareness, maybe a little more underlying confidence and thus rather than drown in his own misery he shows us the conflicting emotional terrain he’s navigating in real time which makes his portrayal remarkably three-dimensional. He does all this with such a light touch that it may be hard to notice without taking the time to sit and analyze it the way you have to in order to expound on the record over two thousand words or so. In that sense maybe the average listener in 1949 missed the way he shades certain sentiments, but I doubt it. First off they obviously liked it or it wouldn’t have been such a hit, but more to the point the moody atmosphere of In The Middle Of The Night is SO strong that it’s bound to come through even without putting the record under the microscope. The performance is a perfect distillation of Milburn’s vocal mastery (the technical execution) and his artistic instinct (the creative decision making process which led to those technical choices) as he sounds almost as if he’s rehashing in his mind everything that’s happened which has led to this point yet is still holding back some of the details – even some important details – rather than expose them to our ears. Yet they factor into HIS perceptions and that in turn factors into his delivery and that is where his intellect becomes readily apparent. In ALL failed relationships there are high points as well as low points that define it and become intermingled when reviewing the circumstances that led to the end of it all. Moments that you keep coming back to, small and insignificant to outsiders maybe but which in your mind were the fulcrum the entire relationship hinged on. It could be anything from an internal decision on how to act, or react to an issue you’re faced with that was just a little unsettling… a question of withholding judgment or expressing it firmly in an effort to take control and head off future problems… a stand you either are willing or not willing to take based on your own deep seated character traits… split decisions which wind up determining your fate as a couple. There may not be any blame to be laid at either partner’s feet. No right or wrong. Just two people dealing with uncertainty that inflicts every life and attempting to manage it to their satisfaction without upending the other’s sense of emotional security in the process. Amos Milburn has clearly been down that road and now he is grappling with the aftermath of a choice – however minor – that turned out wrong and sent the entire love affair collapsing like a house of cards. His voice hints at the longing for her that he still feels as the song opens, as if he wants to push aside the circumstances that got them to this point and try and recapture the spark they once had. The way he holds the words “dreams”, “back” and “me” in the opening line, all emphasized and all revealing in a telling way as to his ultimate wishes that they get back together even as he forces himself to leave his true intent a little more ambiguous by framing it as an esoteric thought rather than a definitive statement. Yet as he goes on the details that creep into his thoughts can’t help but come out, sometimes just in fragmented images, constantly shifting and catching the light differently, wanting at times to let her know how he aches and then pulling back to project a more bemused shrug of the shoulders that suggests he’ll accept her loss without protest. Throughout it all is Maxwell Davis’s gently sympathetic horn, its tone sounding like a layer of wispy fog hanging over the waterfront dive Milburn is surely ensconced in, nursing his third drink with a slight ironic smile attempting to mask the hollow look in his eyes. Like the fog that won’t dissipate until morning comes Davis never allows that mood to lift, keeping the clammy damp feel clinging to Milburn, forcing him to hunch his shoulders for warmth to shield himself from the colder thoughts that runs through his head. It’s a masterful balance they achieve, neither one letting go of the underlying feeling of grief, yet neither one fully giving into it either. When Milburn hones in on some of the specifics, revealing in the bridge that the break up only just occurred last night thereby giving us a hint that this may wind up just being a temporary split that ends with reconciliation, he doesn’t let on whether he’s willing to swallow his pride in order to appeal to her to give them another chance. Whatever brought them to this point seems to run deeper than whatever fleeting argument they had over dinner and it seems like a reasonably sure bet that they were on shaky ground leading up to that. His words may be expressing his need for her but tellingly his actions haven’t gotten him to move out of the bar, not even towards the pay phone in the corner to try and make amends. Old friend Gene Phillips lends a comforting shoulder to lean on with his sparse guitar solo, haunting notes ringing through the smoky scene, maintaining the downbeat mood without choosing sides in this affair, almost as if he knows – just as well as Davis does – that Amos is just going to have to work this one out on his own. By the end of the night, whether because Milburn’s run out of money to buy another round, or the bartender announces last call before closing, or simply because Amos has hashed this over enough by this point and there’s no more left for him to say, he’s probably no closer to a resolution. The thing is, if you’ve been paying attention, the outcome has already been decided. It’s been decided by the girl in question who called it quits with him. It’s been decided by Milburn too, who seemingly didn’t protest when she did say they were through but rather grabbed his hat and coat and left, maybe with more resolve than he showed later on In The Middle Of The Night as it were, when his conflicted emotions come back to the surface as he sits alone and replays the sequence of events over and over. Whether the reason is a sense of righteous justification or just plain defiant stubbornness thus far he’s stuck with that decision and didn’t go back. He won’t either. That much I’m sure of. Maybe if she breaks down and calls him he might return for another romp between the sheets, but I don’t think that’ll happen. She’s not giving up her power for good by reconsidering and he’s not humbling himself to go crawling back and give her the upper hand forever. The two of them, however long they were together, and it doesn’t sound like a lifetime for what it’s worth, will go their separate ways, both hoping the next time they run into each other that they’ll have someone new on their arm so the confident smile they offer one another will be genuine. If so it’ll be the only victory either one will realistically be able to claim. The only victory that is other than Milburn’s decisive win for delivering yet another startlingly real and wholly effective vignette on record. A scene that – even now – I can easily picture in my mind, aided perhaps by memories of the flickering black and white images of some old movies (put Humphrey Bogart’s Rick Blaine from Casablanca in this song and you’ll get the visuals to match the aural sentiments), but entirely believable. Its success on the charts was wholly deserved, records this well-crafted don’t grow on trees, but it’s entirely likely that in this case at least it was propelled upwards by Milburn’s red hot winning streak. Any new Amos Milburn release at this point – up to and including him captured on tape hailing a cab or arguing over the Dodgers-Cardinals pennant race that was heating up as the summer began – would surely crack the Top Ten. But was In The Middle Of The Night really that much better than those records that had failed to find an audience a year earlier? No, probably not. What’s more was THIS type of Milburn record, languid and morose, something that would reach such heights without his name selling it? Again, probably not. As good as it is, as really good as it is even, the charms of this approach are best appreciated when taking the time to study it carefully, something we here are required to do, and proud to do, but something which the average listener in the heat of the moment when new records are coming out fast and furious each and every week, all vying for their time and money rarely have the luxury of doing. 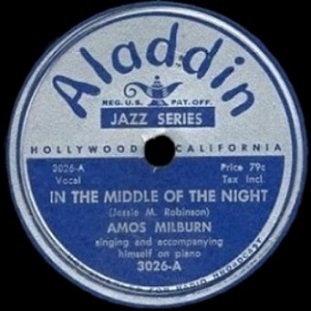 So with that in mind we can say that we’re thrilled that Amos Milburn had risen to the level where ALL of his new releases for the time being would be afforded such undivided attention by listeners, but at the same time we understand that in slightly different circumstances this same record would be at risk for getting overlooked. But while he’s on top all ears would be cocked towards whatever he laid down and when what he’s laying down is so consistently high class you’d have to consider yourself lucky that you were there to enjoy it. I don’t know how to judge this one. I know it’s not one of Amos’ absolute best records, but is one of my personal favorites. This is the kinda record you play while staring out the window with a cup of coffee simply thinking about your life thus far. That’s how well this record establishes its own atmosphere. I’ll hand it an “8” with a small smile on my face. Leave a reply on "Amos Milburn: “In The Middle Of The Night”"